Here’s what I’ve noticed about these kids lately. How the world conforms to their beliefs instead of the other way around. It’s like that great quote by Erich Heller: Be careful how you interpret the world; it is like that. And maybe you couldn’t tell but this post is about Valentines Day. About how easy it is to love these children. How, even though last Wednesday when I exhaustedly and grumpily declared it a nap day and sent the kids to bed with irritation puffing cartoonishly out of my ears, by the time Col woke one hour later I rushed to snuggle him, all the annoyance wiped cleanly away as if by a big, chalkboard eraser. Because that’s how it is. Love at its best is like this crowbar that keeps prying your heart open wider and wider and you think it could actually burst but really it’s just expanding to contain more than you ever thought possible. Blend the walnuts in a food processor until crumbly, then add (slowly) apricots, salt, honey, vanilla, cinnamon. Process until well mixed. 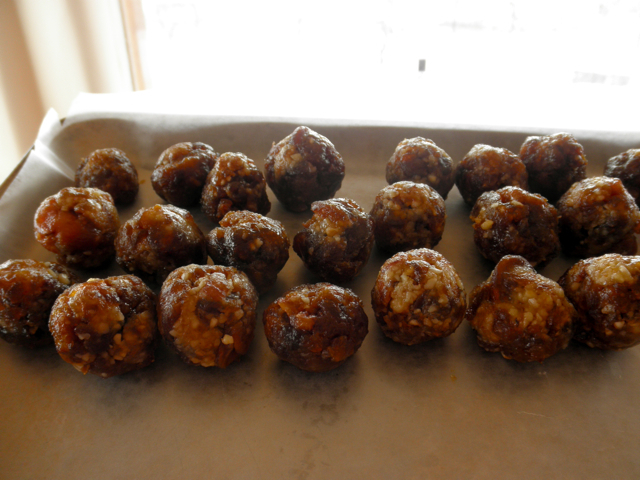 Roll with your hands into teaspoon-sized balls and place on wax paper lined baking sheet. Melt chocolate on very low heat. 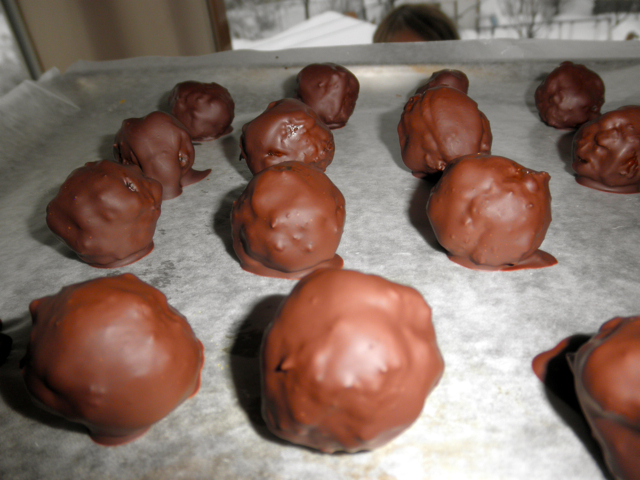 Roll apricot balls around in the melted chocolate with a spoon and lift out onto waxed paper. Chill in fridge for 20 minutes. Devour…I mean, save for Valentines Day. I love how fancy they look, and how your mix could include anything: peanut butter and honey, walnuts and dates, coconut and rum, or sauerkraut by gum! Store in fridge or freezer. How do your children see the world? My 7 year old asked if I was looking forward to the kids moving out and having their own houses some day. I told her I really enjoy living with her now and that I will look forward to visiting her in her own place when she’s bigger. :) When I was growing up my Dad and Step Mom gave us 6 free weeks to live at home after college, after that we had to pay rent. If Col and Rose really want to live with us when they grow up, they’ll be considered interns, in charge of weeding the garden and patrolling for roadkill on the highways. Luke loves to take pictures & it is funny to look at them to see what HE sees :-) I think I am going to make the truffle recipe for tomorrow! This looks like a great one without peanuts, which is hard to find. Thanks!!! Love between parents and children. Dad called me this morning ‘to check on the roads’ (we are experiencing winter weather.) For a moment I felt the slight rise in irritation. My independent self raising its head. Like what, I am not able to drive myself home? (Read that with a very snotty teenage girl tone. )and I didn’t actually say that. And he doesn’t even have kids yet! It’s always amazing to me, and sometimes disapointing, how the wonderous things in life so often seem so obvious to Cedar. He sees life as wonderful and magical, so why wouldn’t big fluffy snowflakes fall from the sky, and of course caterpillers turn into butterflies! Yum, yum, yum. I think I need to make these (my late-last-night attempt at honey divinity having failed spectacularly). I have one child who sees the world VERY literally, and every word spoken must be true and right and around whom I’m never allowed to mention the little gnomes that live inside the streetlights and change them from red to green when they see a car. I have one child who very firmly believes in wishes and magic and is convinced that if he leaps off the couch enough times he will teach himself to fly and whose current future career goal is “Ninja”. And I have one child who is a third child (if only by a minute) and therefore about him I have much less firm impressions than the other two, so I can’t really put into words his world view. Hmm, I should probably work on paying him a bit more attention. I * love * your description of love…and those truffles look mighty tasty too! i know you’re watching portlandia, and so the first thing that came to mind when i saw the naked truffles was, “you could pickle that”. Mine are firmly convinced that they will live with us forever, and that when they are grown-ups the rules will magically change so that they are in charge. And I keep saying, “Sure, you can live here forever, but they’ll still be my rules.” We’ll be 90 and 60, I imagine. on a completely different note, I keep meaning to ask you: has it been a year since the tonsillectomy? What differences have you noticed? Do you remember your worry, and how do you? Wouldn’t that be fun? Your kids and their spouses and you and R all shacked up together FOREVER? It is almost a year since the tonsillectomy and although there hasn’t been a miraculous growth spurt (yet), Col has been very healthy. Typically in a year he’ll have 4-6 rounds of antibiotics, but this year: one. One! Also, we haven’t busted out the nebulizer once. This is actually tremendous for him and I’m the teensiest bit nervous about even saying it (ON THE INTERNET, which didn’t you once prove that God reads?) because you know us Jews and the evil eye and everything, but whew, seems that without his gnarly tonsils to squat on, the germs have been few and far between. On worldview: My girl told me the other day that perhaps the rec center was torn down recently so the pool would be an outdoor pool, and it was just built back up right before we arrived. And that she’d had a dream of Peter and the Wolf, and in it a fox came and chased the wolf away. She told me the store of Goldilocks and the Three Bears, when I said I’d forgotten it, and then when she was done she said I should tell it to her, because she’d only told me the WORDS, and she wanted the story from me. *orphan questions* love this term so much. perfect pairing. ” Love at its best is like this crowbar that keeps prying your heart open wider and wider and you think it could actually burst but really it’s just expanding to contain more than you ever thought possible.” I just love the way you write so much, each time I click here I nod and smile as I scroll down, always leaving with a full heart, happy mind. Thank you. Happy Love Day. Isn’t it wonderful that you are raising your children (and so many other commenters here) to believe in magic and fantasy and fairy tales! I LOVE it! We all need it! I did the same for my children (who are all grown up now with children of their own) and I have so much fun telling my grandchildren about the Teeny Weenies who live in the back yard and leave little notes and surprises in little mailboxes for them. 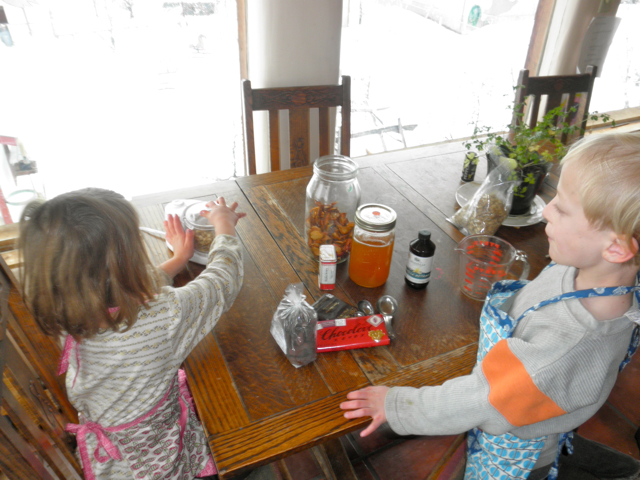 The grandchildren are 5, 2 and 1 1/2 years old and they love the magic! Such fun!!! I’m normally a lurker but his post pulled me out of the Internet abyss. My dad died when I was 18, long before my 3 year old daughter was even an idea. The other day, though, she walks into the kitchen and says, “I was just playing with grandpa Andy and he was throwing me in the air and catching me and I was laughing and laughing!”. It took me aback at first and then I thought why the hell not? There’s much I don’t know and I only wish I might be so lucky to hang out with my dad at will. I’m so thankful to hang out with little people and all their fantastical wisdom. Liz, Thanks for coming out of the lurk to comment. That is a sweet, sweet story. And, exactly: “why the hell not?” Dan’s father died before Col and Rose were born but he tells them so many stories about his dad, he feels sort of like a regular family member. Plus Dan’s dad was a huge fan of wild mushrooms, as is Col (which seems a little unusual for a 7 yr old), so we like to say he got that from Hal. 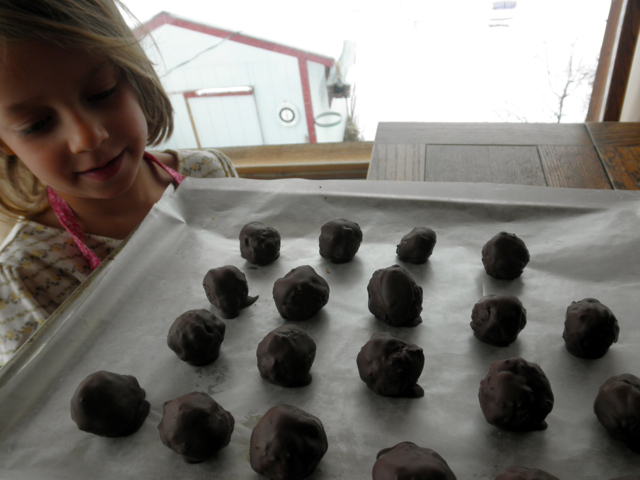 Hi Rachel – my lil truffles for my Valentine sweetie – inspired by you – were a big success. what I had was three dates, one fig, some coconut & pecans – I whizzed it all up in Cuisinart w some candied ginger. I rolled the balls in a lil sugar. I put ‘em on deck to cool. Fortunately I had put a brick on top of the lid covering ‘em – as I think a squirrel tried to get at ‘em with no success. 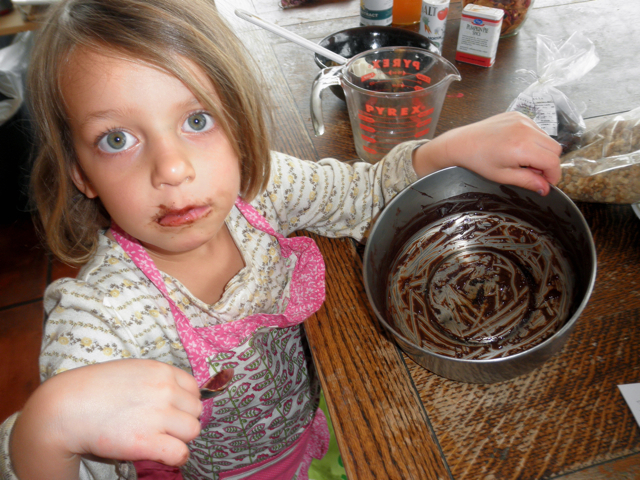 My chocolate was some dark choco bits (not The Best, but ok) that I melted in double boiler. To the extra left over, I added a lil bit of water, swirled it around & will make some hot chocolate some morning. Overall, it was fun – and I will do it again – thanks to you for making it sound easy enough to try! Wonderful writing, wonderful looking truffles. Thanks for such a beautiful post! that crow bar is working on me and ouch! the stretching is insane! Tell me about it! I’m bruised up over here. I wish all parents in this world were like you Rachel. So sweet. Yes. Totally. It’s words like these that you magically string together that keep me coming back. You have such an amazing gift! With the bounty of apricots this summer, do you think this recipe would work with fresh apricots as well? I don’t think so. I think they’d be too moist and mushy.